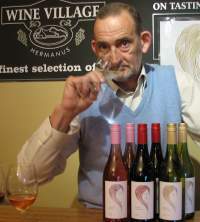 The owner of Wine Village – Hermanus. Wine may be his passion, but as the Race Office manager of the Absa Cape Epic and organising many a sporting event Paul just loves to put athletes to the challenge. Do you remember the first Hermanus Mountain Run in the early 2000′s? Yes, that’s him.